Imagine a soldier who can change the color and pattern of his camouflage uniform from woodland green to desert tan at will. Or an office worker who could do the same with his necktie. Is someone at the wedding reception wearing the same dress as you? No problem - switch yours to a different color in the blink of an eye. A breakthrough in a University of Central Florida lab has brought those scenarios closer to reality. 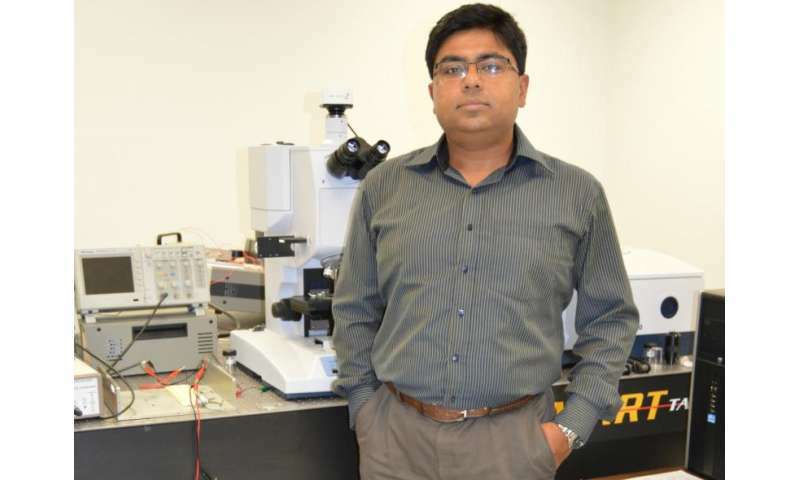 A team led by Professor Debashis Chanda of UCF's NanoScience Technology Center and the College of Optics and Photonics (CREOL) has developed a technique for creating the world's first full-color, flexible thin-film reflective display. Chanda's research was inspired by nature. Traditional displays like those on a mobile phone require a light source, filters and a glass plates. But animals like chameleons, octopuses and squids are born with thin, flexible, color-changing displays that don't need a light source - their skin. "All manmade displays - LCD, LED, CRT - are rigid, brittle and bulky. But you look at an octopus, they can create color on the skin itself covering a complex body contour, and it's stretchable and flexible," Chanda said. "That was the motivation: Can we take some inspiration from biology and create a skin-like display?" As detailed in the cover article of the June issue of the journal Nature Communications, Chanda is able to change the color on an ultrathin nanostructured surface by applying voltage. The new method doesn't need its own light source. Rather, it reflects the ambient light around it. A thin liquid crystal layer is sandwiched over a metallic nanostructure shaped like a microscopic egg carton that absorbs some light wavelengths and reflects others. 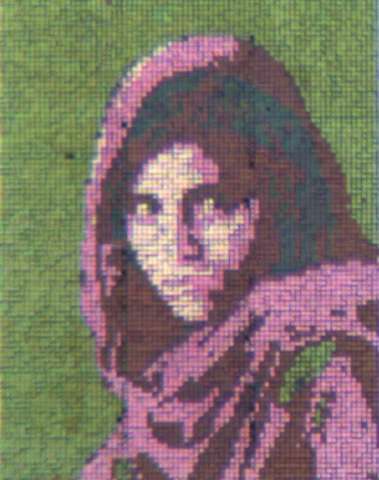 The colors reflected can be controlled by the voltage applied to the liquid crystal layer. The interaction between liquid crystal molecules and plasmon waves on the nanostructured metallic surface played the key role in generating the polarization-independent, full-color tunable display. His method is groundbreaking. It's a leap ahead of previous research that could produce only a limited color palette. And the display is only about few microns thick, compared to a 100-micron-thick human hair. Such an ultrathin display can be applied to flexible materials like plastics and synthetic fabrics. The research has major implications for existing electronics like televisions, computers and mobile devices that have displays considered thin by today's standards but monstrously bulky in comparison. But the potentially bigger impact could be whole new categories of displays that have never been thought of. "Your camouflage, your clothing, your fashion items - all of that could change," Chanda said. "Why would I need 50 shirts in my closet if I could change the color and pattern?" Researchers used a simple and inexpensive nano-imprinting technique that can produce the reflective nanostructured surface over a large area. "This is a cheap way of making displays on a flexible substrate with full-color generation," Chanda said. "That's a unique combination." Imagine a soldier who can change the color and pattern of his camouflage uniform from woodland green to desert tan at will. Or an office worker who could do the same with his necktie. "Why would I need 50 shirts in my closet if I could change the color and pattern? Depends. Is the display machine washable? This is awesome. I wonder who will buy him out or how he is going to market/license this technology... This is the holy grail of thin membrane displays- if, indeed, it lives up to the hype. And, as the previous poster mentioned, is it machine washable? An important feature for textiles. As far as camouflage; it would be cool if a camera/processor could take in the surrounding area and project a seamless image onto the wearers material, imitating a cloaking device. "Suspect was seen wearing a dark grey hoody and black slacks.. - wait a minute, an update.."
If you link the display up with a camera, and point the camera to what is at your backside, you can become invisible. is it machine washable? An important feature for textiles. I was thinking especially if they say it could replace 50 shirts. Because that would mean I would be washing this one shirt 50 times more often than each of the 50 shirts it replaces. Not quite. Only to someone staring at you from the exact opposite direction of the camera. To anyone else it will be quite visible. To get invisible you'd need holographic projection capability. But for camouflage it certainly would work in man cases. Think about what happens when you back up against a wall. You become a human microscope because whatever is right in front of the lens will get magnified onto your shirt. Interesting. Invisible would indeed not be possible like this but what if you combine this with a lens system like wowvx (https://en.wikipe...i/WOWvx) you could get some pretty amazing 3D effects no? WOWVx (and similar) only work for a small range of angles...and then only in the lateral direction (if you move up or down - i.e. if you have a tall and a short observer - you will still note a difference). These systems require rigid parallax barriers which means they are not suitable for flexible surfaces like clothes. Also the bars are effectively areas that are blocked. Since the system shown in the article works off ambient light you'd notice that it would be dimmer than its sourroundings. If you want to hide from a static direction without any kinds of light sources or dimming then do what hunters do. Just use a slightly angled mirror. Imagine fashionable clothes connected to a small computer that could change the color and pattern of the fabric continuously in real time.